Beyond the modern metropolis of Honolulu’s world-class shopping and dining, Oahu’s breathtaking scenery awaits. 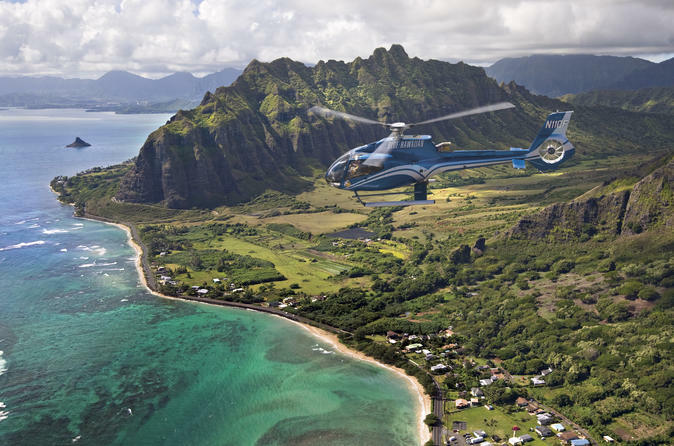 Enjoy this 60-minute guided Oahu complete island helicopter and discover the Diamond Head's extinct volcanic crater, the pristine coral reefs of Kaneohe Bay, the landmark of Chinaman's Hat, the "Jurassic Park" like cliffs of the Nuuanu Rainforest, the breathtaking North Shore and Sacred Falls, the panoramic Dole Plantation, and of course the unmatched power and emotion of Pearl Harbor and the Arizona Memorial. Admire the 4000 foot Waianae mountain range and the rustic Leeward Coast which is the home to the luxurious Ko Olina resort area, Makaha Beach (where big wave surfing began), and Yokohama Bay. This small-group guided tour is limited to a maximum of 6 travelers. Choose from a morning or afternoon departure when you book. Nothing is more seductive than beautiful Waikiki Beach, except a beautiful tour above Waikiki Beach. Enjoy lilting Hawaiian music through Bose aviation, grade noise, canceling headsets, while your expert Blue Hawaiian pilot, a State of Hawaii certified tour guide, lifts you gently into the blue skies of Oahu. Cruise past such framed hotels as the Royal Hawaiian, the Halekulani, the Moana Surfrider, and more. See the gorgeous tableau of Waikiki's white sands, palm trees, and gentle surf, framed against the majestic volcanic crater of Diamond Head. Yet Waikiki Beach is just the beginning of Oahu's countless treasures. The scenery of this unique island has appeared in scores of Hollywood films and television series, such as Pearl Harbor, Jurassic Park, The Lost World, George of the Jungle, Pirates of the Caribbean III, Lost and more. In fact, Blue Hawaiian flew aerial photography for all of these blockbuster productions, and for many more film and television projects across the Hawaiian Islands. So get ready, because a succession of stunning sights, like a string of glittering pearls, awaits you: Honolulu Harbor, graced by picturesque Aloha Tower, heart-tugging Punchbowl, the National Memorial Cemetery of the Pacific, and the splendid crescent of Hanauma Bay. Gliding eastward, it's like you've gone to another world: a world that truly can be appreciated only from the panoramic cockpit of an Eco-Star helicopter. Appreciate this spectacular coastline, the Makapuu Point and lighthouse, Mount Olomana, legendary "Chinaman's Hat" (proper name, Mokoli'i), and the soaring Nuuani Pali where Blue Hawaiian helped capture some of the most powerful images in the film Pearl Harbor and the lust and dense Nuuanu Valley Rainforest. Then it's time to see the breathtaking coastline of Sacred Falls and the expansive Dole Pineapple Plantations. Finally, no tour of Oahu would be complete without the inspirational nostalgia of Pearl Harbor. Here is the emotions epicenter of American pride in our nation's endurance and ultimate victory in World War II, with its haunting Arizona Memorial - a symbol of the beginning of the way - and the mighty U.S.S. Missouri, where the surrender was signed. Every year, millions of people make a timeless pilgrimage of gratitude and homage to this hallowed place, yet now you can see it all with the perspective you can only get from the air. Unforgettable.